Effective management of diabetes depends upon on a delicate balance between medication and diet control. A diabetic diet should consist of a good combination of nutrients i.e. carbohydrates, protein, fat, vitamins and minerals to stay fit and fine and to keep the blood sugar levels in check. Here’s a list of foods allowed, restricted and forbidden for diabetics. Also read: Do you know what is Precision Diabetes? These are foods with a low glycemic index and hence a large part of your diet should comprise of these foods. Foods with a low glycemic index gradually increase the blood sugar levels and so are good for diabetics. Complex cereals like whole wheat, whole wheat noodles, bajra, jowar, ragi, wheat bran, rice bran, barley, etc. Dals and pulses like moong dal (split green gram), tur dal(arhar dal), rajma (kidney beans), moong (green gram whole) etc. All vegetables like cluster beans, spinach (palak), brinjal, cabbage, methi (fenugreek) etc. except those mentioned in the restricted list like potatoes, yam and sweet potatoes. Low fat dairy potatoes like milk, curds (dahi), paneer (cottage cheese) and buttermilk. Fruits with low sugar and high water content like pineapple, watermelon, orange, papaya etc. Have only one serving of fruit at a time. These are foods with a high glycemic index and they can escalate blood sugar levels faster than foods with a low glycemic index. Indulge in these foods in moderation and only as an occasional treat. Sugar rich fruits like chickoo, custard apple, grapes, mango and banana. Vegetables such as potatoes, yam, purple yam and sweet potato. Biscuits such as Digestive and Marie. These foods are best avoided as they can only cause harm to your health and have little or no nutritive values. These can escalate the blood sugar levels almost instantaneously. Refined sugar, honey, jaggery, jam and jellies. Deep fried foods like wagers, samosa, farsan etc. High fat salad dressings that use cream, mayonnaise etc. Aerated drinks, preserved or canned fruits and fruit squashes, which contain loads of sugar and preservatives. Nuts like dried cashew nuts, almonds etc., as they are high in saturated fat that gets converted to cholesterol in our body. Sweetmeats like peda, barfi and all other mithais. Chocolates, biscuits made with refined flour, full fat ice-creams, puddings and pies, high sugar and cream content. 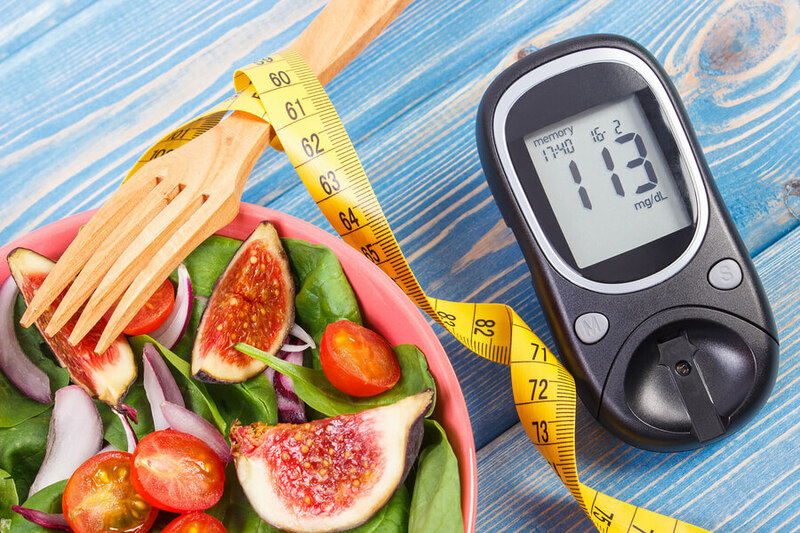 It is true that diabetes is a condition that requires you to take special care of your diet. The quality and quantity of the food you eat need to be monitored carefully as minor changes in your meal habits can lead to either low blood sugar levels (hypoglycaemia) or high blood sugar levels (hyperglycaemia). Worried about what to eat and how exactly? Given below are some tips to help you control blood sugar levels and avoid any further complications. Have a balanced diet, which includes complex cereals, pulses, fruits and vegetables. In cereals, whole wheat is better than rice because it contains an enzyme called Acarbose, which allows carbohydrate to be absorbed slowly. Thus, the blood sugar does not rise rapidly. Have only one source of protein like dal, milk or curds in each meal. If you are used to having thick dal, try to dilute it, as that will cut down on the protein content drastically. Even the buttermilk you consume should be diluted with water to reduce the intake of concentrated protein in your diet. Consume plenty of fibre-rich foods such as whole cereals, pulses, raw vegetables and fruits. These help to lower blood sugar levels, as they have a low glycaemic index and lead to a gradual increase in the blood sugar levels. On the other hand, restrict all fruit juices and fruits like mango, chickoo, custard apple, banana, as they have a high sugar content. Avoid starchy vegetables like potatoes, yam, etc. as these tend to increase blood sugar levels rapidly. Restrict the consumption of fat to 3 teaspoons per day. Avoid snacking on fried foods like samosas, wafers, etc, as these are unhealthy. Have cereals, fruits and grilled, boiled or stir-fried dishes. Try and avoid processed and refined foods such as maida, noodles etc as they have a high glycemic index and can escalate the blood sugar levels very rapidly. These foods have virtually no fibre and so are not very healthy. The biggest culprits are bakery products and savoury farsans. Avoid sugar, jaggery and honey. Also avoid the consumption of sweets such as barfi, halwa, jams and jellies. Use artificial sweeteners instead, but again remember moderation is the key. Consult your physician for the choice and quantity of artificial sweeteners to be consumed. Try and avoid the consumption of carbonated beverages as these provide no real nutrients but only empty calories, which mean calories that can increase your weight. Use artificial sweeteners in moderation. Consult your doctor about the choice and amount of sweeteners to be consumed. If there is any change in your schedule, either in meal timings or of other activities, please consult your physician to adjust your medication to suit your new schedule. Have an early dinner before retiring for the night and have a glass of low-fat milk at least 1.5 to 2 hours after dinner as this helps to prevent hypoglycaemia (low blood sugar levels) during the night. Try to eat in a calm atmosphere as stress or anxiety can impair the productions of insulin. Read the nutritional labels on food packages carefully for proper selection of foods, particularly those claiming to be low-fat foods. Low-fat products may actually contain more fat than you think. Walk for 15 to 20 minutes after every meal as exercise utilizes the sugar present in blood and helps insulin work better. In case you do indulge in a favourite pastry, compensate for it by walking a little more.